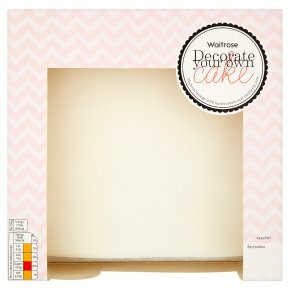 Ready to decorate, this 20cm square madeira sponge is filled with buttercream and raspberry jam, topped with white icing. Serves approximately 16. INGREDIENTS: sugar, wheat flour fortified (wheat flour, calcium carbonate, iron, niacin, thiamin), rapeseed oil, pasteurised free range egg, Raspberry Jam (6%) (maize and wheat glucose-fructose syrup, raspberry purée, sugar, gelling agent pectin, colour anthocyanins, acidity regulators sodium citrates, citric acid, flavouring), butter (milk) (4%), water, invert sugar syrup, maize and wheat glucose syrup, humectant vegetable glycerine, skimmed milk powder, raising agents disodium diphosphate, sodium hydrogen carbonate, cornflour, palm oil, modified tapioca starch, stabiliser tragacanth, palm stearine, dried maize and wheat glucose syrup maize glucose syrup, salt, emulsifier sodium stearoyl-2-lactylate, flavouring, acidity regulator citric acid, preservative potassium sorbate.